With so many Fuchsia varieties available and new hybrids released every year it is best to divide them into flower types and growth habit. 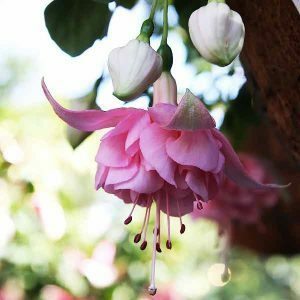 In terms of flower fuchsias may be either single or double flowering and include both bell shaped flowers and the long F. triphylla types. Growth habit includes upright bushes, lax types and traillining types. 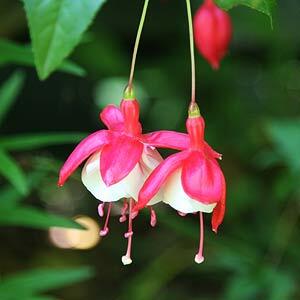 Some are Fuchsia varieties are vigorous and others are more compact and bushy. And of course the species from where all of the hybrids have been derived, many very attractive in their own right and worth a place in the garden. Single flowering upright bushy habit with deep red sepals and an aubergine corolla. Vigorous and best in the garden or large pot. Double flowering with deep red sepals and a deep purple corolla. A trailing type well suited to a hanging basket or growing where it can tumble down over awol. Long flowering and vigorous. A Double flowering type with pink sepals and a clear pink corolla. Large flowers and a long flowering trailing type suited to hanging baskets. Prune this type in late winter, with a light pruning in summer to helpmkeep a bushy habit and promote more flowers. Double flowers with a vigorous but slightly lax habit suited to hanging baskets, however it will outgrow them in a few years. Pink sepals and a deep salmon corolla.